The U.S. Embassy in Skopje, Macedonia, is working to raise awareness of how breast cancer affects women and families around the world. In the United States alone, nearly 3 million women and men are living with or have beaten the disease, and more than 39,000 women die each year as a result of it. To bring attention to the ongoing fight against breast cancer here in Macedonia and around the world, please join us for “Wear Pink Day,” this Friday, October 26. Participate by wearing something pink to show your support for those who have suffered from this disease, and ongoing research into treatment, prevention, and cures. 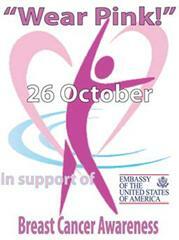 In recognition of October as Breast Cancer Awareness month, the U.S. Embassy will also be “going pink” throughout the weekend of October 26.